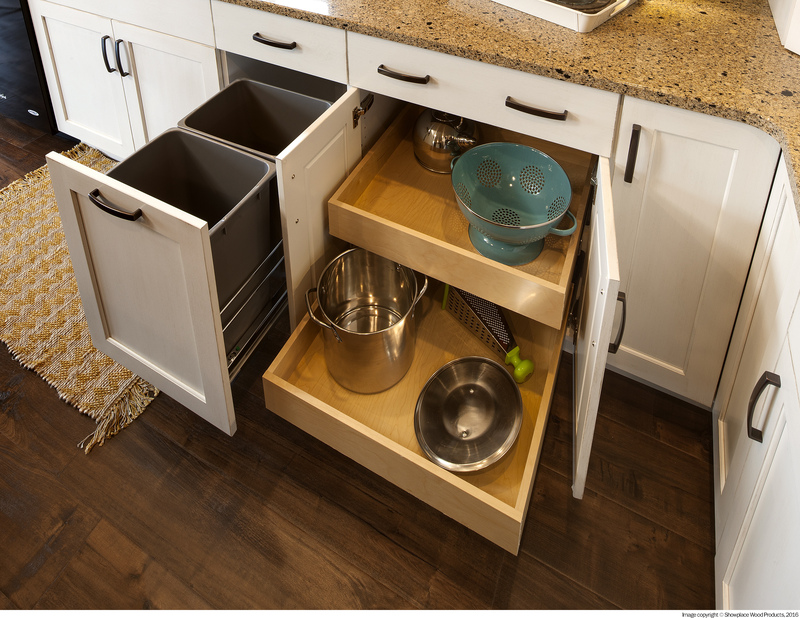 With a brand new kitchen, it’s not just the cabinetry, the backsplash, or even the countertops that are taken into consideration, it’s also all the different types of cabinet storage solutions! These solutions are what elevates your kitchen from good to GREAT! An empty cabinet interior is okay, but a cabinet interior with a storage accessory that works for you is life changing! It will elevate the functionality of your space and make organizing a breeze. Want to learn more about our favorite storage solutions you can incorporate? Read more below! 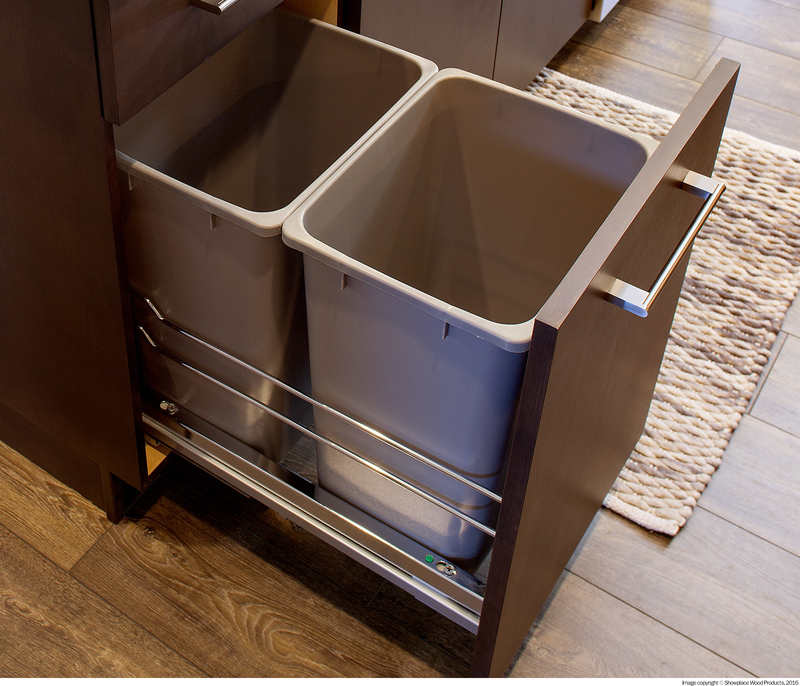 A roll-out drawer is essentially an interior drawer that you simply pull-out. Roll-out drawers are awesome! They can store pots, pans, lids, small appliances, and more. If you have cabinetry where you have to dig everything out just to find that one item (sound familiar, anyone?) then the roll-out drawers will become your best friend. This will not only help you with organization but it will also give you a complete overview of what’s in those cabinets. Drawers containing cutlery tend to be cluttered and dumped with a hodgepodge of cooking utensils. Plus, if you like to cook, you probably have many different types of cooking utensils! 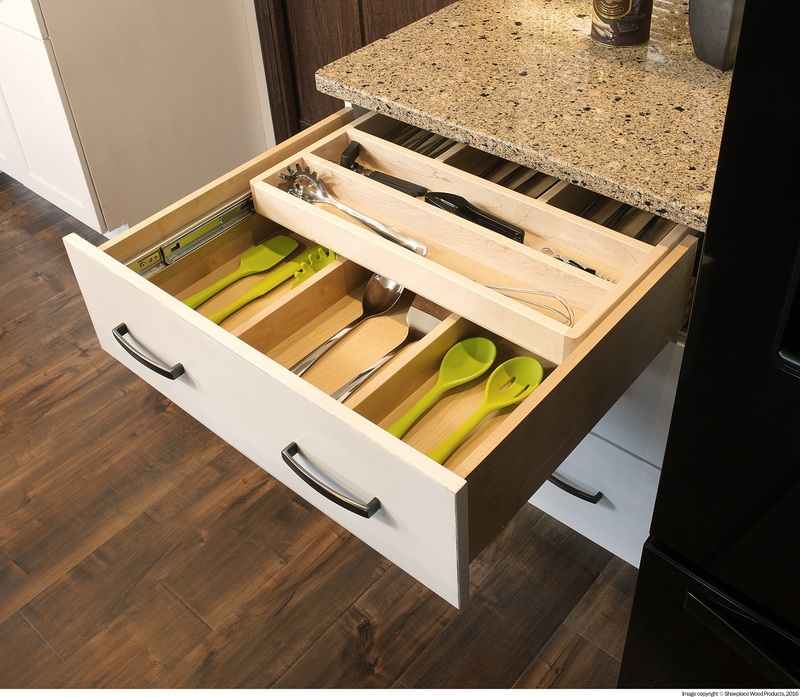 Well, a quick and easy solution for that is to incorporate a cutlery divider to get your drawers organized. Now, cutlery dividers don’t discriminate, you can even utilize these to organize your mess drawer/s! If you were only able to have one type of storage solution, we would recommend a slide-out waste. This solution takes care of the “oh, I’ll place the trashcan at the end of the kitchen” problem. It fits perfectly inside the cabinet (we recommend a cabinet next to the sink), it’s convenient, and perfectly conceals your waste. Certainly, no one wants their trashcan on display! 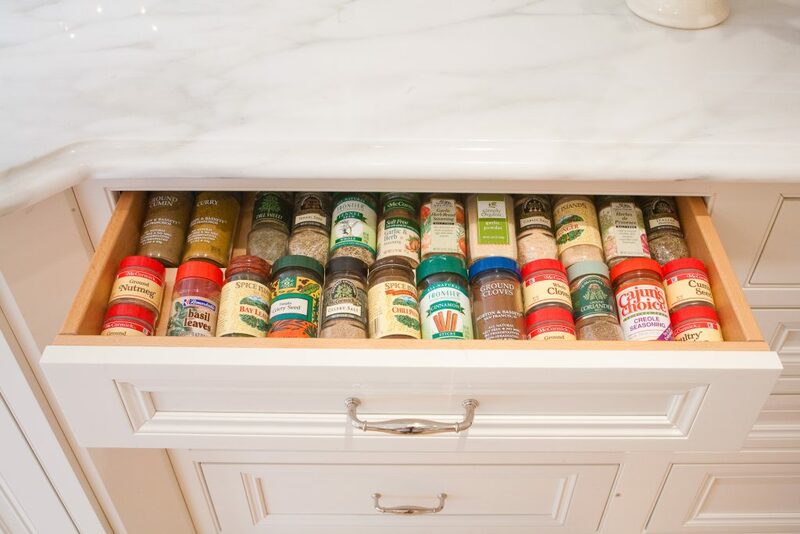 If you’re constantly having to pull out several different spices to find the right one hidden in the back of your cabinet, then this solution is for you! In addition, a spice rack can sit inside the cabinet door, or even be placed in a drawer. Now we’re talking a perfect overview! Who else has a bazillion different types of spices? 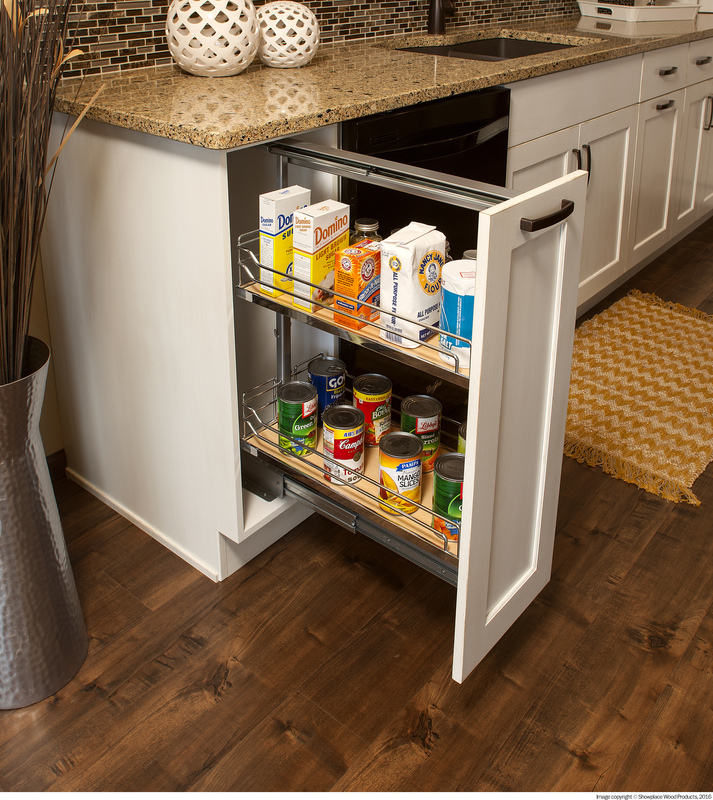 A pull-out pantry is a great cabinet storage solution for many different things. For example, you could have a pull-out pantry by your cooktop and store all your cooking oils and spices. Maybe you’re a baker? You could store all your baking goods where you like to bake. Besides, you could get creative with this one, it’s a pantry after all! Interested in designing a well-functioning kitchen complete with all your favorite storage bells and whistles? Let us know!